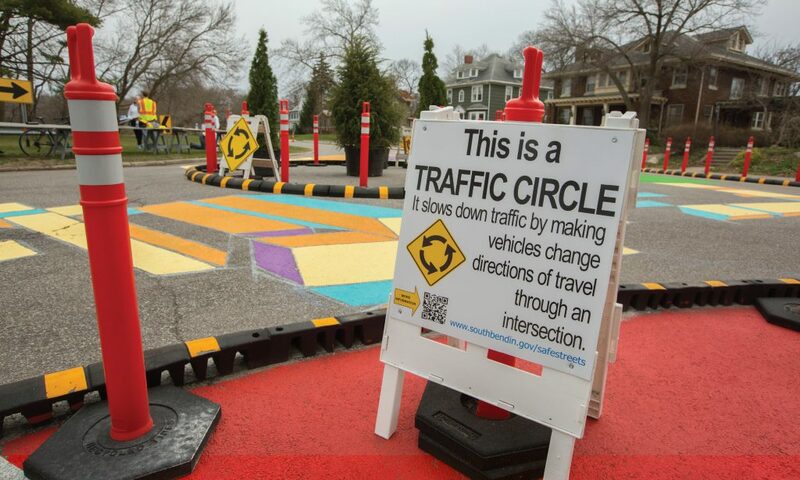 South Bend’s demonstration project used tactical urbanism to slow down cars and included educational signs about how the new street designs calm traffic. In the City of South Bend, speeding in neighborhoods is a common, unaddressed safety concern. In some neighborhoods, people feel uncomfortable walking along their own streets or letting their children play outside and frequently raise these concerns with the city, requesting speed humps and stop signs to slow down drivers. To better address speeding on neighborhood streets, a team from South Bend applied for the Safe Streets Academy. They used the strategies they learned through the Academy to test out new traffic calming techniques and show the community the variety of different tools at their disposal to encourage drivers to slow down. The team focused their efforts on one neighborhood west of downtown South Bend with frequent speeding problems where they knew they could count on strong, vocal support from the community for safety improvements. In South Bend, community engagement is sometimes thought of as a cumbersome process that could delay or kill projects. 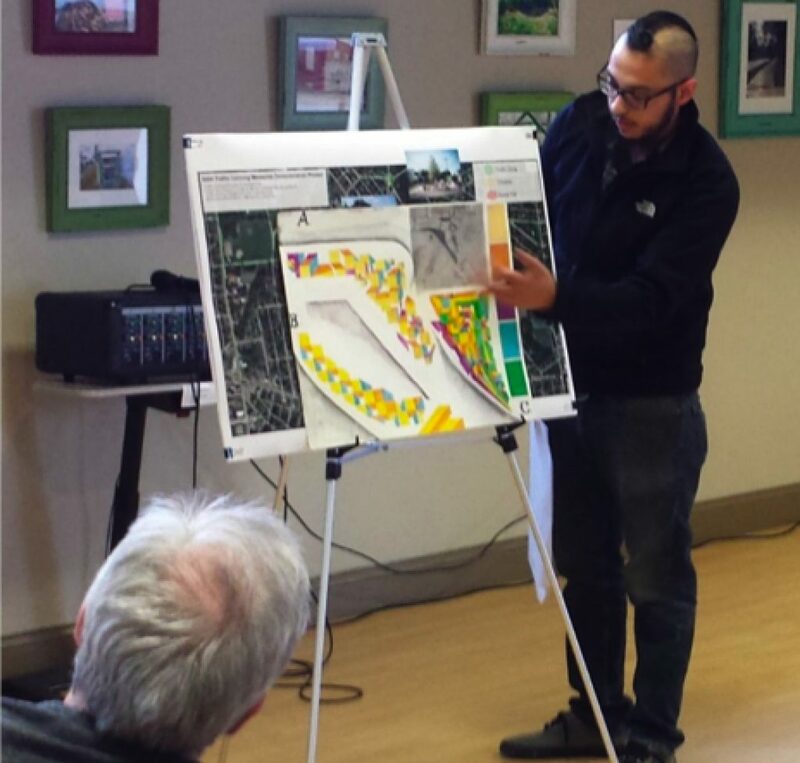 However, through their short-term demonstration project, the South Bend team discovered that the more creative community engagement tactics they learned through the Safe Streets Academy can actually help deliver projects more quickly and effectively, because the community’s local knowledge can be a better guide for the planning process. The team went beyond typical informational public meetings in city buildings by hosting pop-up workshops at local events, including the neighborhood’s annual chili cook-off and a local coffee shop. At these interactive workshops, the team collected input from residents about where they felt most unsafe or uncomfortable walking in their neighborhood. They also held small group discussions about the safety benefits of slower speeds and introduced people to new tools for traffic calming. People were initially apprehensive about some of the unfamiliar road design features, but because these safety improvements were only temporary to start, they were willing to try them out. Local residents helped the South Bend team pinpoint opportunities to test our new traffic calming tools, especially at dangerous (red) and uncomfortable (yellow) intersections in their neighborhood. A local artist designed street art to paint on the pavement as part of South Bend’s demonstration project and presented his concept to the community. The South Bend team also wanted to use their demonstration project to get the community excited about opportunities for creative placemaking. Through the Safe Streets Academy, the team learned how communities are working with artists to implement creative placemaking transportation projects that increase safety and give the community greater ownership over the planning and design process. They decided to do the same and reached out to an artist who lives in the neighborhood to design an art installation for the project. Once it was time to install the project on the ground, the team invited local residents to help paint the artist’s design onto the street. As a result of this hands-on community engagement, local residents and city staff developed stronger working relationships. The residents learned to trust that city staff were listening to their safety concerns and working to address them, and the team learned to trust the local community to pinpoint problem areas and, once the project was implemented, to provide feedback about which measures were working and which needed some further adjustments. 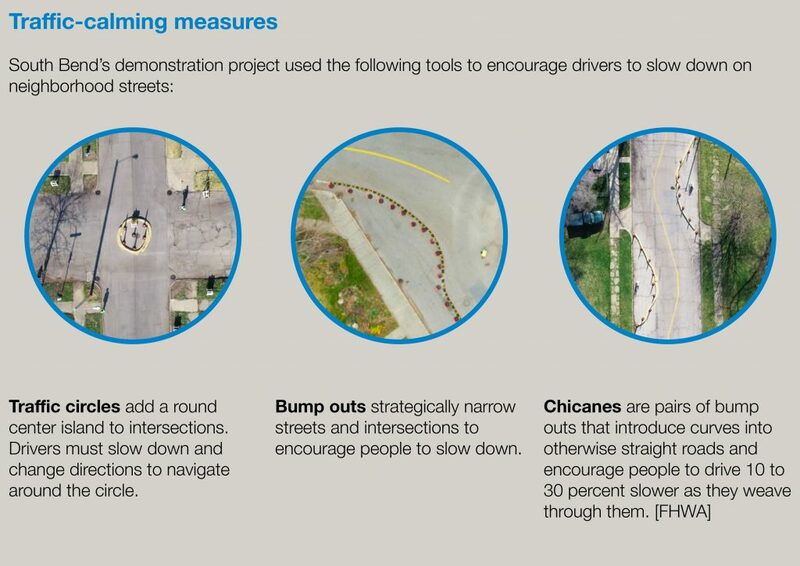 Based on community feedback, the South Bend team decided to test out three different traffic-calming measures in five locations throughout the neighborhood. They installed two traffic circles, two chicanes, and one bump out all within the same neighborhood to give people a sense of the variety of tools at the city’s disposal to make local streets slower and safer. The largest installation in South Bend’s demonstration project was a traffic circle at the intersection of Riverside and Hudson Avenues. This intersection is often used as a cut-through to downtown, with drivers speeding through the wide, unusually angled intersection at over 30 miles per hour or more, even though the speed limit is 20 miles per hour. To encourage drivers to slow down and watch out for people walking, the team used rubber curbing and vertical posts to transform the intersection into a traffic circle. They also invited the fire department and first aid squad to come test out the circle first to ensure fire trucks and ambulances could fit through before securing the curbing in place. Then, to make the project more exciting and memorable, they invited local families and elected officials to help paint colorful patterns on the pavement. This traffic circle was designed to remain in place for 90 days with the option of installing more permanent safety improvements with support from the community and elected officials. 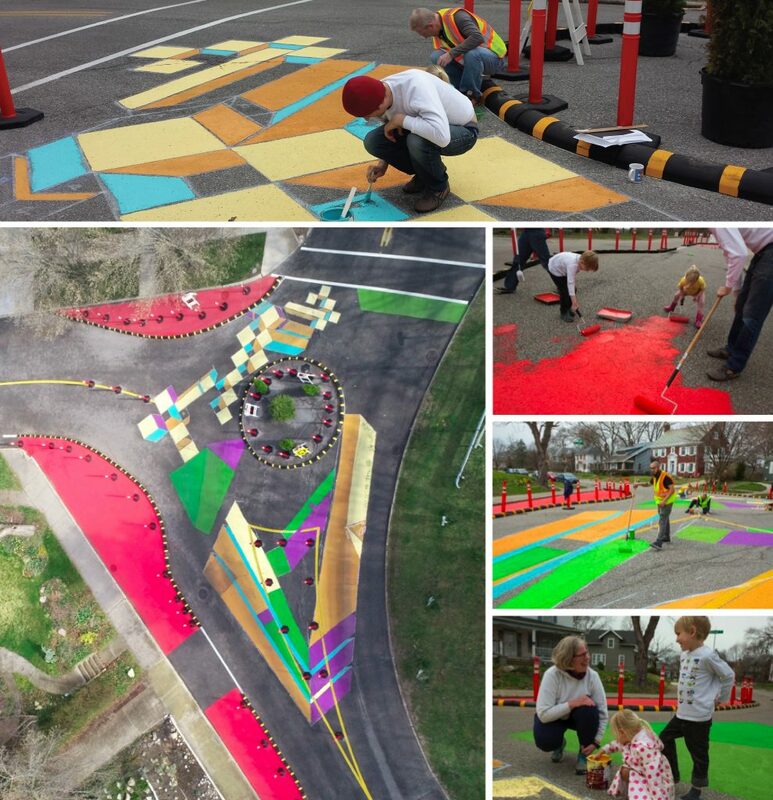 Local families worked together with city staff and elected officials (including Council Member Jo Broden, bottom right) to paint bump outs and decorate the temporary traffic circle at Riverside and Hudson. 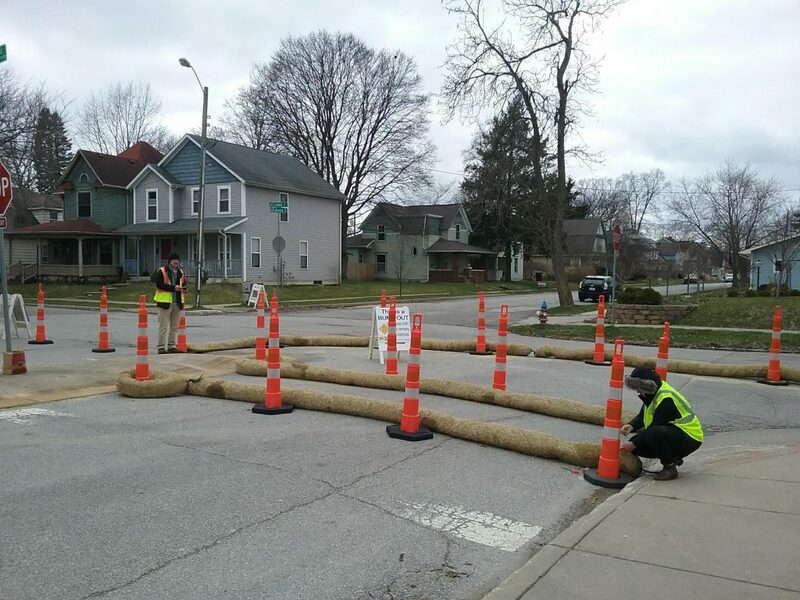 To demonstrate the variety of potential neighborhood traffic calming strategies, the South Bend team also installed four shorter-term demonstration projects for 30 days each. They used cones and straw logs to mark out bump outs, chicanes, and another traffic circle at various points in the neighborhood so people could see how these other types of safety improvements work in practice. The team also included informational signs at all five project sites to teach people about safer street design. The signs introduced people to the traffic calming feature, explained how it improved safety, and directed people to a website where they could find more information about the project. 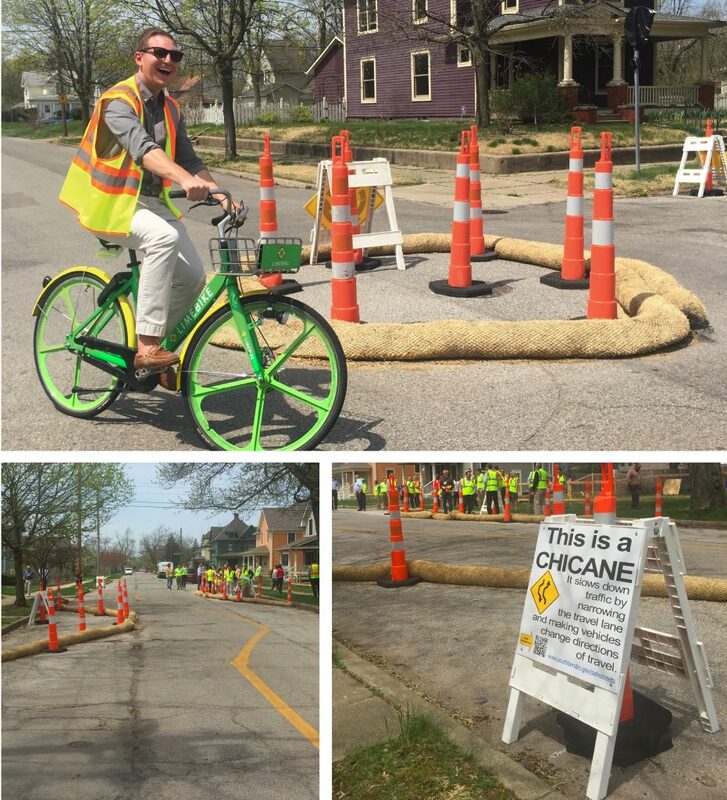 The other Safe Streets Academy teams from Orlando and Lexington visited South Bend’s demonstration project and tested out the traffic calming installations on foot and on bike. Using temporary materials like cones and straw logs made it easy for the South Bend team to make adjustments to their project as needed. For example, local residents observed that larger vehicles like school buses had difficulty navigating the smaller traffic circle and making turns at the new bump out, so the team was able to quickly respond to this feedback and reshape these intersections accordingly. Neighbors also noticed that people were driving down the middle of the road instead of properly weaving through the new chicanes. As South Bend considers converting the chicanes into permanent improvements or introducing them in other neighborhoods, they’ll know to bring the chicanes closer to the center lines of the road or add a physical barrier down the middle. The South Bend team adjusted their temporary bump out based on feedback from nearby residents. Thanks to South Bend’s safety improvements, traffic slowed down measurably. 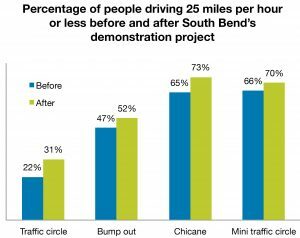 The share of people driving 25 miles per hour or less increased at all five installations, especially at the main traffic circle. Before the project, only one out of every five people drove 25 miles per hour or less at this intersection, but once the team installed their traffic circle, one out of every three drivers drove this slowly. As a result of these projects, South Bend generated support from the community and from elected officials for future traffic calming projects and other safety improvements. The team will use this experience to develop a traffic calming toolkit to be used with other communities throughout the city to make neighborhood streets slower and safer for people. 1. Temporary demonstration projects are a great opportunity to test out new ideas. Because they start out as temporary, demonstration projects can be especially useful for testing out new ideas that the community might otherwise be resistant to. In South Bend’s case, people were unfamiliar with traffic circles, bump outs, and chicanes, but despite their skepticism, they were willing to at least test them out on a short-term basis. Thanks to their use of flexible materials, the team made minor tweaks and adjustments to the project in response to neighbors’ observations about how the traffic calming tools were working on the ground. Now that they’ve tested out these changes temporarily, it will be easier for South Bend to make permanent safety improvements with stronger support from the community and more confidence in how to design and implement these traffic-calming tools moving forward. 2. Trust with the community goes both ways. The South Bend team relied heavily on input from the local community to pinpoint problem areas throughout the neighborhood and to observe how the projects were working on the ground. Trusting the community to provide local knowledge and insight helped the South Bend team more effectively tailor their project to the neighborhood’s needs on a very short timeframe. Additionally, the team’s trust in the community helped build up the community’s trust in the city because residents knew that the team was not only listening to their concerns, but also taking action to address them. The Safe Streets Academy is funded by Road to Zero, a coalition of almost 700 organizations committed to reducing traffic fatalities in the United States to zero over the next three decades. To learn more about this demonstration project and similar projects in Orlando and Lexington, read the full report here. To learn more about this demonstration project and similar projects in Orlando and Lexington, read the full report here. To learn more about this project directly from the team who carried it out, watch the recording of the kick-off webinar here.